See the seadragons! Buy tickets online—no ticketing service charge. While they may not be the fire-breathing animals of myth, the seadragons at the Aquarium (found in the Thinking Gallery on the second floor) are pretty remarkable. 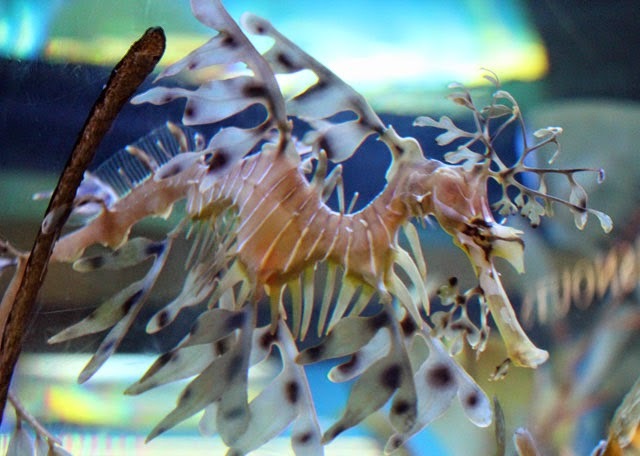 We are lucky enough to have two species of seadragon—leafy and weedy. 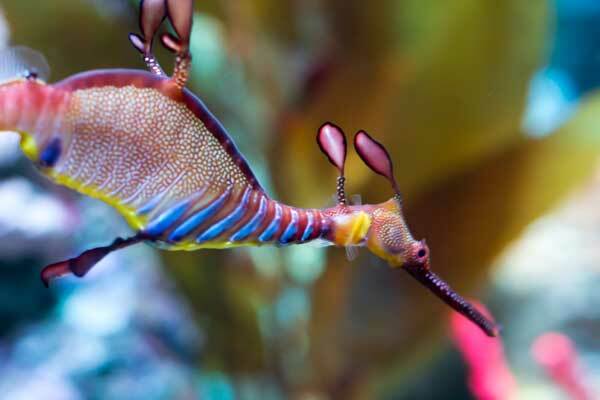 The weedy sea dragon (Phyllopteryx taeniolatus) has smaller appendages but more varied color. 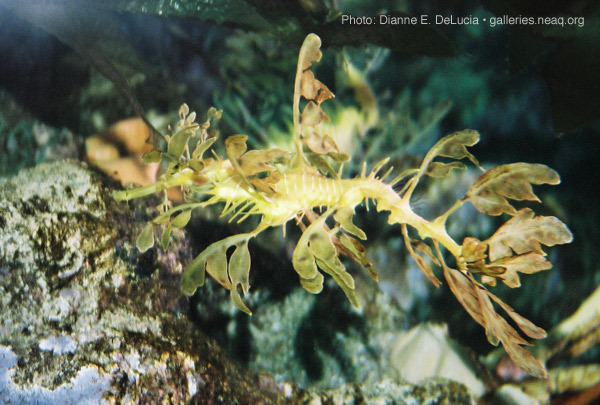 The leafy seadragon (Phycodurus eques) is the species with the more ornate, leaf-like appendages. These animals are what are known as endemic. Endemic means they are found in only one location on the planet; in the case of seadragons, they are found only in southern Australia. Until very recently, scientists thought these were the only two species of seadragon. But in early 2015 researchers report having identified a third species of seadragon—the ruby seadragon! In 2009, New England Aquarium Senior Aquarist Jeremy Brodt, went on expedition to this seadragon habitat. You can read his final blog post from that expedition here, and check out this video he took of a leafy seadragon male in the wild. If you look closely you can see he has eggs on his tail! These fish are obviously designed for camouflage. In fact, the fins that they use for propulsion are almost entirely transparent, so even when they are swimming they just appear to be floating—and this helps them to look even more like just another piece of seaweed. 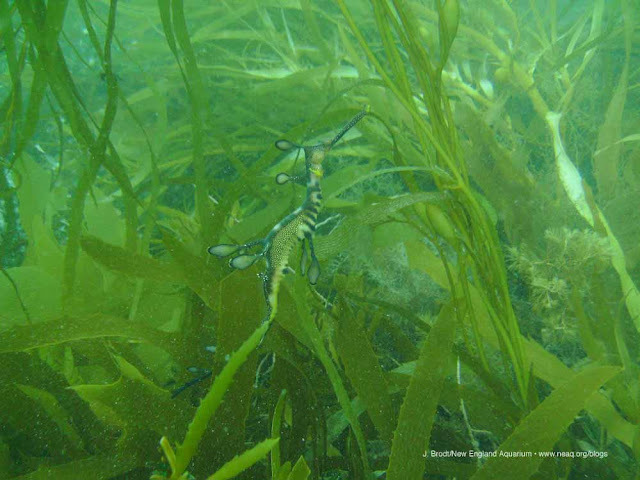 While these adaptations help sea dragons to avoid predators, their excellent camouflage also makes it very hard for scientists to get a good population count in the wild. However, even though their numbers are unknown, they are cherished animals in Australia and are protected due to their small geographic range. So next time you’re at the Aquarium, make sure you stop by and check out these charismatic fish. Meet Octavia the giant Pacific octopus!